The Dudley Arms is a 17th Century coaching inn situated in the picturesque village of Ingleby Greenhow, located on the edge of the North Yorkshire Moors. We are renowned for our fantastic steak options, all butchered and prepared in our own kitchen. We pride ourselves on using locally sourced seasonal produce in all of our meals to offer a taste sensation to all of our diners. We pride ourselves on the quality of our beef and believe that our steaks are second to none! We have two areas for dining, our main Dudley restaurant which provides an unusual Tudor style design, together with our cosy Bistro which exudes a warm welcome. The Dudley Restaurant was added when the Staples family took over in the 1960s. And believe us you won’t have ever dined in anywhere like it. It has to be seen to be believed. 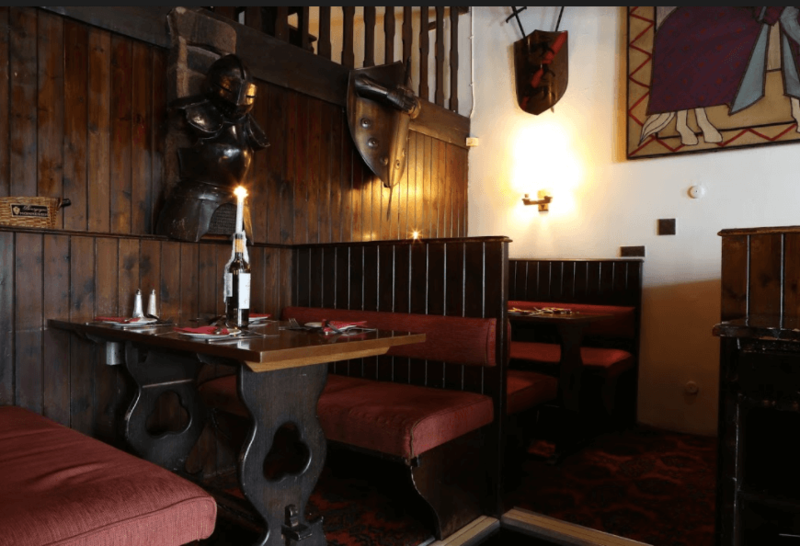 From its vaulted ceilings to medieval style tapestries to its mezzanine style alcoves, the Dudley restaurant is great for an intimate meal for two as well as party occasions. Meanwhile our Bistro area provides a less informal setting, popular with our lunch time customers as well as early evening and private dining options. The Bistro serves light bites, 3 course lunch & early evening menu, available Monday – Saturday. See our menu pages for our seasonal options. If you wish to book a table in the restaurant, please call us on 01642 722526 or drop us a message on Facebook or on email at Dudleyarms@hotmail.co.uk. We always advise to book a table and we will be able to let you know which part of the Dudley Arms is available at the time of your booking. Our menu page has details of all the menus we have available, though some are subject to alteration depending on the season. We always try to include the best of the season within our menus and amend them regularly. If you wish to purchase gift voucher for friend and family, please contact us and we can help arrange this. If you have any specific dietary requirements we are always happy to accommodate these, please mention at the time of booking so we can discuss your requirements. Join our scheme to obtain credits which can be off set against future meal and drink costs.